'Pudge' celebrates a pick -off at 2nd base ! 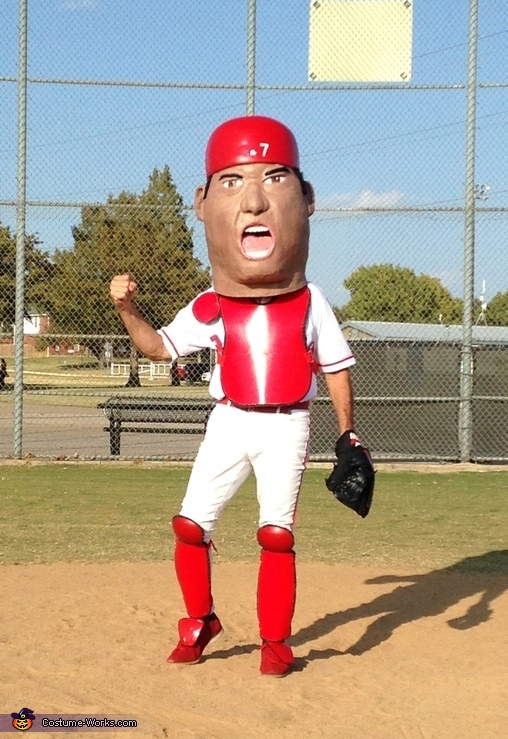 That's me wearing the costume that was inspired by Pudge's recent induction into the Baseball Hall of Fame. The chest protector and shin pads are made of a cut up floor mat covered with pieces of a vinyl table place mat. "Rodriguez" on the back of the shirt was cut out letters from large iron on patches. The bobble head started with chicken wire frame covered with foam rubber then paper -mache , and finished with bondo and paint . While taking the attached photo at a local ballpark, I was approached by several kids and parents wanting to have their picture taken with "Pudge"! That was a real hoot !